Wounds heal - the cells in a body knit over a cut. When a neuron dies, the brain can rewire itself to make up for the loss. And now, new research suggests, something similar seems to happen within a human social network after the death of a friend. Published in Nature Human Behavior, a study of 15,000 anonymized networks on Facebook suggests that human social structures are resilient to death. When a friend dies, we get closer to that person's friends, with the network repairing itself in ways that keep our total connectedness the same. The study - the first large-scale study of recovery and resilience after a death in a friend group - was led by William Hobbs, who conducted the research as a University of California San Diego doctoral student in political science in the Division of Social Sciences. Hobbs is now a postdoctoral fellow at Northeastern University's Network Science Institute. His co-author on the paper is Moira Burke of Facebook. Before undertaking the work, the researchers wondered: What happens to a social network after a central individual dies? Do people drift apart - does the network dissolve? Or does the network heal to fill the hole left by the loss? "It was a surprise to see just how much people came together after a mutual friend's death and how long this persisted. Friends and acquaintances of the deceased increased interactions with each other not just immediately after the death, in the acute grieving period, but for years afterward," Hobbs said. Prior research on network response to emergencies and natural disasters suggests that people can quickly form temporary bonds that also quickly dissipate. To evaluate the resilience of social networks after a death, the researchers used de-identified Facebook data as well as public vital records from the State of California. They analyzed the traffic of interactions in more than 15,000 networks that had experienced a death. There were a total of more than 770,000 people in this sample. They compared these bereaved networks to 30,000 similar networks that had not experienced a death, representing more than 2 million additional people. The researchers focused their analysis on aggregated counts of Facebook comments, posts and photo tags by close friends and acquaintances of the deceased. They compared counts of these interactions, over four years, before and after the death. What they found is that interactions between people who had lost a mutual friend increased sharply immediately after the death, faded somewhat in subsequent months and then settled down to levels of interactions that were similar to total levels of interaction before the death. In other words, on the network level, Hobbs said, people compensated for interactions lost with the deceased by increasing interactions with each other. "We can't speak to the subjective experience of loss and recovery, but on the level of a network, it looks like the amount of increased interaction is equal to the amount of interaction lost with the person who died, and there's a complete recovery of connectivity," Hobbs said. 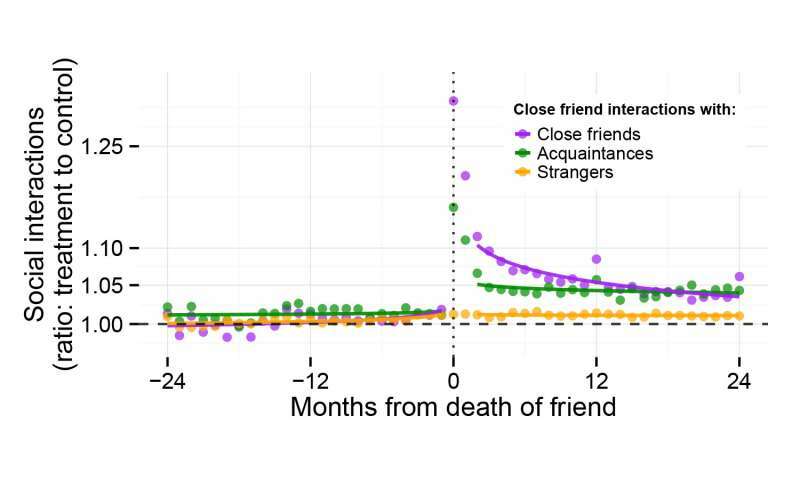 Friends did not increase their online social interactions in general - with people who were strangers to the deceased, for example. And network response to death was different than response to a deactivated account. Both are indicators that what the study observes is not just a display of people returning to some optimum level of online social interaction, Hobbs said. Something is happening in a network as a result of a person's passing that spurs the network to heal. In an accompanying News & Views article in the same journal, Robert Bond of Ohio State University, who is also an alumnus of UC San Diego but did not participate in the research, writes: "The increase in interaction in bereaved networks suggests that people are changing their interaction patterns in ways that are likely to provide support to those who are experiencing grief." The recovery effect was most pronounced among young adults, those aged 18-24. In this group, interactions didn't merely stabilize at previous levels, they actually stabilized at higher levels than before the death, Hobbs said. All other age groups returned to prior levels, making up for interactions lost with the deceased. Still, the researchers call for additional research into differing response by age, which might be useful in designing age-specific interventions to help those grieving. A major exception was suicide. Friend networks experiencing suicide did not recover to the same extent. This is an area that could obviously, Hobbs said, use further investigation. "We hope that these findings spur greater interest in how social networks adapt to trauma and crisis," the researchers write in the paper. "Better understanding of social network adaptations could help us identify why social networks succeed or fail in recovery - and how social network failures might be prevented. The findings here, we believe, are an important first step in this direction."